Ray Kass drawing at Giverny, 2012. Kass exhibition installed at the Turchin Art Center, 2009. 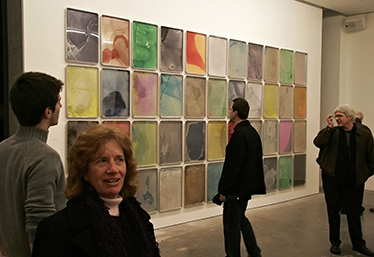 Broad Channel: "Vorticella Polyptych" installed at the Nevada Museum of Art, 1991. John Cage/Ray Kass Exhibition installed at the Baumgartner Gallery, New York, NY, 2007. "A commitment to developing a visual language in both form and content that signifies—rather than pictorially represents—the essential and abiding experience of nature's transcendental energy." ﻿His paintings have been widely exhibited and have been represented in solo exhibitions in New York City by the Allan Stone Gallery, A.V.C. Contemporary Arts Gallery, ZONE: Chelsea Center for the Arts, Baumgartner Gallery, and ir77 Contemporary Art. He has received numerous grants and awards, including individual artists grants from the Virginia Museum of Fine Arts and the National Endowment for the Arts. His paintings reside in many public and private collections. Ray Kass is Professor Emeritus of Art at Virginia Tech, and founder and director of The Mountain Lake Workshop; an ongoing series of collaborative and inter-related workshops centered in the environmental, cultural, and community resources of the Appalachian region of southwestern Virginia. The workshops have resulted in many unique, collaborative works of art that have been widely exhibited. Artists who have completed several workshops at Mountain Lake (or are currently engaged in ongoing projects) include folk-artist Howard Finster, Japanese artist & sculptor Jiro Okura, the late avant-garde composer, writer composer and artist John Cage, waste management installation-artist Mierle Laderman Ukeles (official artist in residence of the New York Sanitation Dept. ), ceramic artist, poet and author M.C. Richards (author of Centering), Colorado-based “EcoArtist”, Lynne Hull, NYC East Harlem “street- artist”, James De La Vega, Zen art scholar and artist, Stephen Addiss, and Paris-based sculptor and virtual-reality “light” artist, Jackie Matisse, as well as Ray Kass himself, among many others. His publications include numerous reviews, articles and catalogs, including: Sounds of The Inner Eye: John Cage, Mark Tobey and Morris Graves, Univ. of Washington Press, Seattle and London (2002) – (also in German: Klange des Inneren Auges, Kunsthalle Bremen/Beyeler Foundation, Munich, 2002), Morris Graves: Vision of the Inner-Eye, Braziller, NY (1983) and John Cage: New River Watercolors, Virginia Museum of Fine Art, Richmond, VA, and a major critical essay in Writings Through John Cage’s Music, Poetry and Art, University of Chicago, 1999. In 2012 he had two extended residencies at MQ in Vienna, Austria. ﻿He is the son of celebrated American Folk Artist Jacob Kass (1910-2000). "Over a period of more than thirty-five years, my out-of-doors water and mixed media paintings of the natural world have developed in my favorite locations in North Carolina, California, Maine, New Hampshire, and Virginia. Although abstract, my recent paintings are carefully derived from drawings and life-studies from nature, and attempt to represent the processes of nature at work rather than pictorial description.